Caption Application Property in VBA represents the name of the title bar that appears in the main Excel widow. If you don’t mention title bar, it displays as “Microsoft Excel”. Here syntax for Caption Property of application object in VBA. In the above syntax Application represents object and Caption is the Property of Application object. 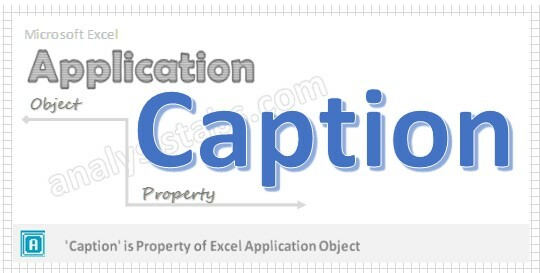 Please find the below example for Caption Property of application object in excel VBA. The below macro displays the caption in the title bar. Application.Caption = "Demo of Analysistabs"
Step 5: Now press F5 to execute the code and find the caption in the title bar window.